You have heard me refer to Homare Ikeda in my blog many times (See my Archives) – my esteemed instructor for Advanced Contemporary Painting at Art Students League, Denver. 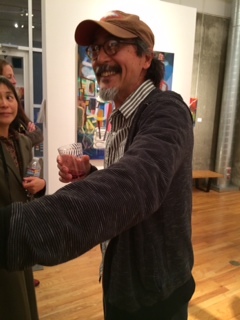 Friday night was his most recent opening titled REVISIT at Wm. 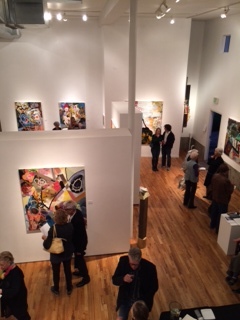 Havu Gallery, www.williamhavugallery.com in downtown Denver. The stories told in his paintings are more than magical – they are transcendent. It is not unusual for him to work on a painting for years – sometimes as long as 18 years – revisiting it from time to time, enhancing, subtracting, building layer upon layer in order to evolve the image through the years of its life. These incarnations of art reveal stories of each particular time and place the painting is revisited. That is why and how his art lives, breathes and grows, revealing a language of intricate symbols expressed in whimsical playfulness that provide the artist with a means of conversation, and the art becomes a dialogue between the artist and the paint. How fortunate we are to be offered a glimpse of this personal communication. 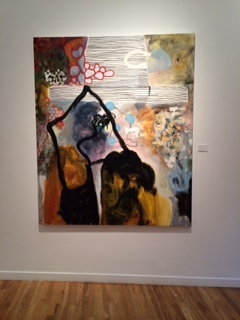 This entry was posted in abstract art, Denver Art Students League, Uncategorized, understanding abstraction and tagged Art Students League of Denver, essence of art, Homare Ikeda, Inspiration. Bookmark the permalink. His work is indeed exquisite. Incredible depth. They make me want to start painting again. And I understand why he wants you to work on one canvas for a year. Thanks for sharing. I’m so glad you shared this, Jo. How wonderful is his work. And now I also understand that year long canvas he assigned to you in class. Now I get it! Yes, the work of an artist is his most personal communication. How I wish I’d been there. So good to hear from you Shimon – I am constantly concerned about you. Yes this show was magical – he is a quiet, soft spoken artist with a slow grin and a twinkle in his eye. He believes in past lives. His teaching is remarkable and I have learned so much from him – of course he is the one who assigned me the challenge of the Year Long Canvas.